If you’ve ever seen a truck commercial, you probably have a good idea of all the practical benefits of owning one, like towing and transporting heavy-duty items. You also might assume most trucks are ready to roll off the showroom floor and into the backcountry, hauling up rough mountain trails and storming through scenic streams. But the truth is that most brand-new trucks are ill-equipped for such adventures with their stock suspension system, which means you’ll need a lift kit to harness your truck’s off-roading potential. The suspension system is the collection of shock absorbers, springs, and other related parts that connect the wheels to the rest of the automobile. It’s essential for keeping your vehicle relatively stable while maneuvering on the road, especially around turns, and it softens the bumps and vibrations for a smoother ride. Most vehicles, including trucks and SUVs, are sold with standard suspension systems, which are often best suited to city or highway driving. In order for your truck to conquer rocks, mud, steep grades, and other obstacles, it will need the higher clearance provided by a lift kit. Higher clearance enables your truck to avoid damage from rocks and debris on the road and ascend steep hills with ease. It also allows room for larger off-road wheels, which are tougher, longer lasting, and capable of driving over any terrain. If you’re looking for some added height and room for larger tires without adjusting the suspension system overall, a body lift kit might be right for you. Body lift kits won’t provide a noticeable difference in handling, and there’s still a chance of sustaining damage from large debris, but they’re a good option for budget-conscious truck owners with moderate offroading ambitions. For the ultimate offroading capability, a suspension lift kit is your best bet. Suspension lift kits elevate the entire suspension system to provide ample clearance between the axles and the ground. The most common suspension lifts offer 4 to 6 inches of extra clearance, while some kits can raise your truck by up to 18 inches. And when you combine a suspension lift with some decent shocks, you can achieve a smoother ride over the roughest terrain. Shock absorbers boost safety and control, and brands with a higher absorption rating will provide a smoother ride. Gas shocks are the best for off-roading because they can handle the stress of unstable terrain for long periods of time. Strut tower braces connect the two strut towers to disperse energy more evenly, prevent misalignment and damage, and provide additional reinforcement to reduce side-to-side movement. Coilovers combine struts and springs in one part, which gives you the ability to raise your truck’s height for offroading and lower it again for city driving. Anti-roll bars link the right and left sides of the suspension to improve your lifted truck’s balance and handling, which prevents dangerous leaning at high speeds. Ready to conquer the San Diego backcountry with a lifted truck? 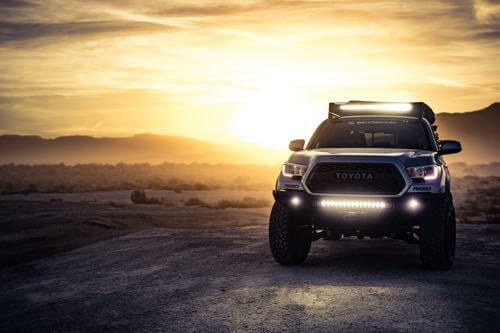 If you want to turn those scenic truck commercials into your weekend reality, the lift kit experts at San Diego Car Stereo can help you pick the best offroad parts at the best prices. We have decades of experience with all makes and models of trucks and SUVs, so give us a call or stop in our convenient Kearny Mesa location today. Call us at (858) 569-0777. Newer PostWhat are the Best Car Stereo System Brands?